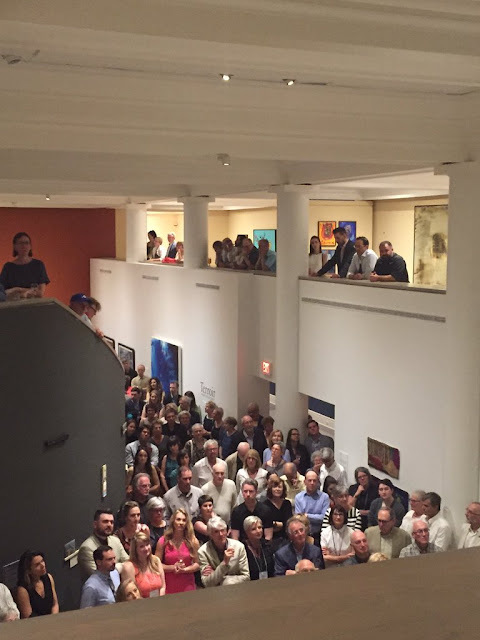 Curators: David Diviney, Curator of Modern and Contemporary Art, Art Gallery of Nova Scotia, Bruce Johnson, Independent Curator, and Sarah Fillmore, Chief Curator, Art Gallery of Nova Scotia. Terroir: Borrowing heavily from the language of wine, this three-part exhibition will look at regional artistic production through the culture from which it emerges. The word “terroir” refers to the complete natural environment in which a particular wine is produced, including factors such as the soil, topography, and climate. Some might say Terroir is long over due. But what exactly is Terroir, and rather than being over due, is it perhaps ahead of its time? There is no doubt Terroir is an exhibition about regional artistic production and fascinating in its duality; a balance between traditional and contemporary media side by side, while creating new platforms for discussion, and still maintaining excellence in craft, technique, and social commentary. But as strange as this sounds, Terroir should also be a time capsule, hidden away to one day be discovered by future generations to ponder and reference when discussing the ethos of Nova Scotian culture, and why it is what it is today. What questions would be asked about artists honouring past traditions, and incorporating them while standing shoulder to shoulder with artists creating art in a markedly new way? If Terroir is anything, this juxtaposition stands out as defining Nova Scotian art in a way that should prove to be prescient, where regional art production may be re evaluated for its merit not only today, but for years to come. If Roberta Smith is correct, and I believe she is, shows like Terroir are not to be ignored. Terms like "the tyranny of taste" have been ringing throughout the hallowed halls of western contemporary art museums for some time now. Widely held assumptions about why such and such a genre is omitted from the post modern establishment are hotly contested among artists in coffee shops around the world. And yet certainly, curators have a million shows they would love to do, but only one life time, so what happens when the turn around occurs, and what was once wrongly or rightly considered retrograde becomes current? Or more specifically, where the regional is focused on front and center with a duality of traditions and modes of expression profiled? As I listened to Pete Luckett, vintner, regale a packed crowd of art and culture enthusiasts at the Art Gallery of Nova Scotia on the opening night of Terroir, I mused upon the notion of how the artists in the show are making art not only with their hands, but also with their heads, and are questioning and exploring globalization, colonialism, Mi'kmaq First Nation ancestry, and other issues related to Nova Scotia - all with respect to a plethora of traditional and contemporary electric media. Pete made me smile as he confirmed there is room for everyone, and my sense was that this phase of Terroir is an exhibition that is needed, or as art critic Roberta Smith once wished out loud, that curators might "think outside the hive-mind." Later on, I found myself mentally making the analogous connection of "Terrior" in wine production to not only the artists that reside in Nova Scotia, but more specifically the twenty nine artists that were selected by curators Sarah Fillmore, David Diviney, and Bruce Johnson for the exhibit. The exhibit is overtly regional in the reference to the title and the Nova Scotian artists included, but it goes far beyond that as the objective is presumably to posit through the art work, reasons for exploring the specifics of an artistic terroir relevant to the times. Actually, it's a lovely title for an exhibition (It seems now everyone just refers to it as Terroir), and conjures up numerous ways for viewers to experience work that is both immediately engaging, and ecumenical at the same time. Survey shows as they're sometimes called, don't always do this. Perhaps it is the way they are structured, and what artists are involved. Terroir questions the term "survey" by circumventing the conventional curated effort of known quantities, and employing a 'call for entry' format instead - thus distancing itself from any preconceived and sketchy notions regarding a conceptual outcome. One need only look at the juxtaposition of Lorraine Field's "Level: Year 2" chromogenetic print, next to Laura Kenney's "At the End of the Day" rug hooking. Both include reclining figures, yet contrasted they reveal a duality; a Nova Scotian day entirely different in both mind and topography. This show was thoughtfully curated with the same disposition a drawing teacher may question the meaning of "sketch", which is often mistakenly exchanged for the more probing term "drawing". A sketch implies something incomplete, where as a drawing, no matter how brief in its execution, entails a complete thought. Terroir is anything but a sketch. It is a complete thought in the sense that it refers to not only the contemporary factors that present themselves to the Nova Scotian artist today, like diverse media and issues both regional and global, but the layers of healthy influence and artistic logic that preceded it as well. On another floor of the gallery, viewers can explore more work assembled from the AGNS's permanent collection (Terroir phase one) that laid the groundwork for Terroir's phase two. Combined, the two shows are stunning, and weave an important narrative that has been unfolding for years, and cements Nova Scotia's reputation as an ongoing channel of significant creative out put. When not painting I restore wooden floors, the difficulty is apprehending the character of the floor while providing a suitable finish for durability. Character in a floor as evinced in its terroir, or conditions. How much character should one remove and how much should one retain? Like wise in art, what are truly an artist's habitat and conditions? And what does it mean to contextualize ones art with ones topography, be it personally or in a more global way, literally ones climate and surroundings? What does the artist remove, and what does the artist retain? As I toured Terroir these were some of the questions I found myself asking. The comparison of a Vintner's practise to an artist's practise invariably arises and the temptation is too great to resist with some works. In wine parlance there is also a term called "epigenetic" - it refers to that which is formed later than the surrounding or underlying rock formation. For the love of plants, the leap to the work of Francis Dorsey is as terroir as it gets. Beautifully crafted moon abstractions confront us with the symbolic horizon dissecting the firmament of sky and water. The moon, our moon, is united by the horizon, hovers in front of the horizon, or sinks into the horizon. They are ghostly and unsettling, yet are peacefully aided by the abstract references of sky, earth, and water - uniting the composition. They're heavily textured weavings with the organic and uneven square enhancing the circular reference to the moon. But it is the natural dyes, in this case local Goldenrod and Alder, dyed in a Cape Breton, Middle River Dye bath, that provide the exceptional hues evident and enhanced under the gallery's soft lighting. Some are reflective while others flatten out depending on the angle and placement of the fiber. The work is an earthy, yet mystical piece, witnessing another work that contains turbulence, man's inhumanity to man, and an issue of jarring poignancy confronting a proclamation that refuses to disappear, is dormant, and sadly remains contained by something composed also of fibre - a pre confederation document. "And, we do hereby promise, by and with the advice and consent of His Majesty's Council, a reward of 30£ for every male Indian Prisoner, above the age of sixteen years, brought in alive; or for a scalp of such male Indian twenty-five pounds, and twenty-five pounds for every Indian woman or child brought in alive: Such rewards to be paid by the Officer commanding at any of His Majesty's Forts in this Province, immediately on receiving the Prisoners or Scalps above mentioned, according to the intent and meaning of this Proclamation." "She then invited a volunteer to come up from the group of participants who would be the last European to “scalp” a Mi’kmaw person in Nova Scotia. She offered up the headpiece as a symbolic scalp to be taken on the steps of Grand Parade Square." Ben Mosher brings the rational of duality to the front row in a series of assemblages uniquely displayed on the gallery's curved wall with a deep earthy background colour to it. Together, they convey an intimate configuration of objects that whisper to the viewer and enable one to chart their way through the series with ease. They struck me as having the kind of humility I would equate with Giorgio Morandi, the Italian still life painter. Personal and collective "memories" forms the intent, as the artist inside questions the origin of their formation. But Mosher doesn't stop with only the physical object. In a fascinating artist statement Mosher remarks: "With digital technologies, our lives are increasingly tethered between two realities, the digital and the physical. This gap interests me." Mining directly the sentimental objects of his personal history, the circular reference in his work suggests the saving, or storage of an object through a piece of found wood that echos the circular shape of the now ubiquitous CD. One need not follow the chronological order of the show to enjoy it. 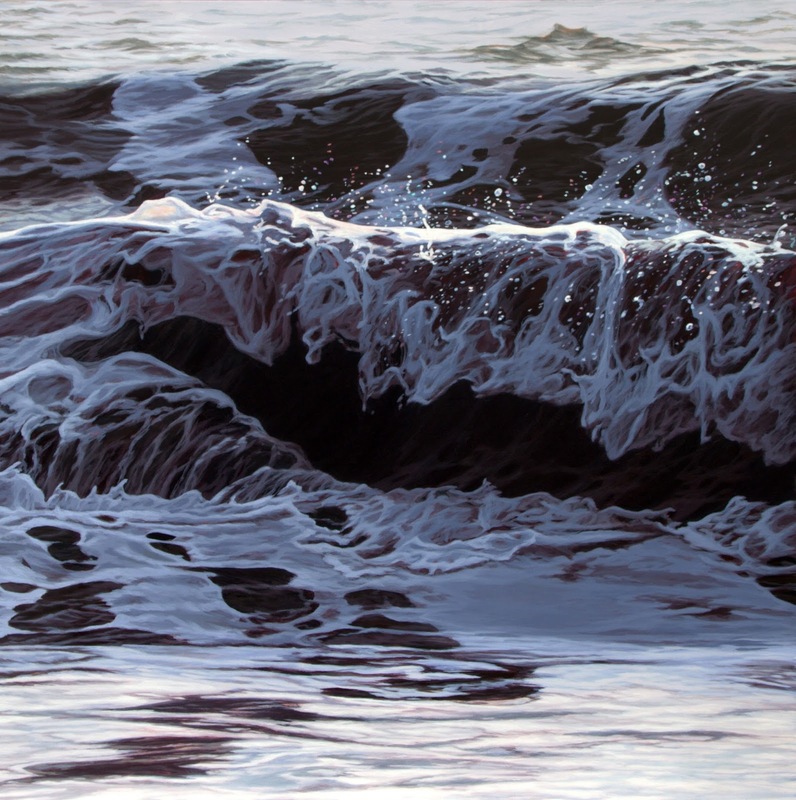 There are plenty of options for divergence, but contemplating Jaye Ouellette's realist wave painting "Euryal" is where I ended up a few times. There is a Northern European resolution to the smoothness of the painting, firmly couched in the realist tradition of the west. The artist's hand is not burnished away though. The brush freely moves over the wave's form with vigour and plenty of gesture is evident. However, the freezing of the wave in motion, moving into decent, and prior to its eventual crashing end, is suspended as the physical (or terroir) draws the viewer in. It's just the illusion of space and water on a flat surface we may tell ourselves, but the image's cave like negative space, and a blood or wine red under painting reveals itself on closer inspection, giving the experience of conditions more than just an imagistic desire for a clear and precise painting. Waves after all are not just salt water in movement, they contain and churn up rock, soil and debris as they reach their eventual conclusion at the shore. Terroir is a complicated exhibition that will take some time to digest. Taking in the work of twenty nine Nova Scotian artists requires more than one or two visits to the AGNS, but my sense is that this show will continue to churn up much more insight about the type of art experience occurring today and in the future, when contemplating our diverse range of artistic practice in Nova Scotia. Roberta Smith, “Post-Minimal to the Max,” New York Times, February 14, 2010. Hi Steven, Love this - thanks! Hope to refer and reccommend viewing on my twitter feed when I'm on Information morning on Friday, Aug 26th at 6:12am. Widely regarded in Nova Scotia as a valued artist for twenty seven years, Steven Rhude has steadily pursued his vision of vernacular imagery with an imposing strategy. Set in unconventional situations, Steven Rhude employs familiar coastal icons, to elbow his way into the viewers mental space. Once there, these objects seem isolated by the long shadow of urbanism, suggesting casualties of coastal life. Although based on real places, Rhude considers the settings in his paintings as ficticious - intended to evoke a cultural or political perspective. Aided by his use of realism and the modernist canon, Rhude's imagery can leave one wondering what the protagonist's strengths really are and whether the object viewed has more than just utilitarian characteristics. Along with humor, a narative is present in Rhude's work and questions remain in the viewer's mind like the residue of a ghostly presence.